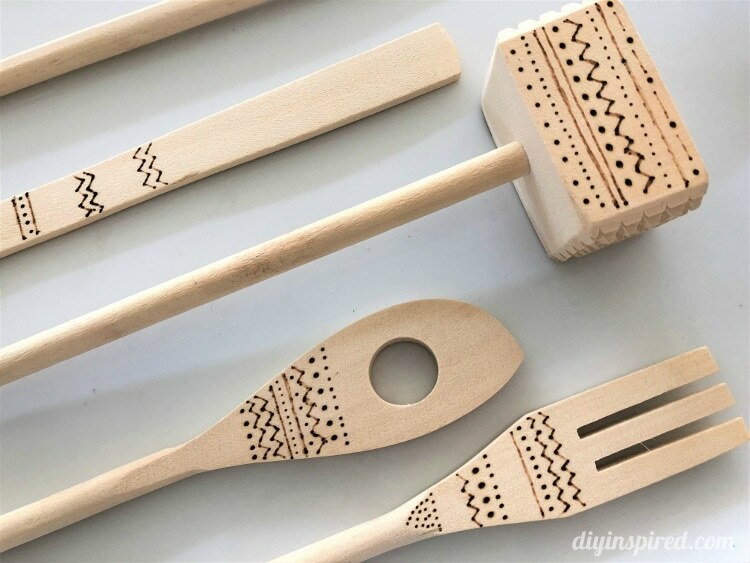 This article, DIY Wood Burned Wooden Utensils, is sponsored by Bernzomatic. All opinions are 100% my own. To anyone who loves to cook! OK, so maybe they don’t have to love to cook. Maybe they just like to display pretty things in their kitchen like I do. First, fill it with butane by holding the butane can upside down and pressing down into the bottom of the soldering iron. You will know it is filled when a little spray of butane comes out. The ST500 works like a lighter. Once it is ignited you will see the orange and red of the flame through the holes. Turn it to continuous mode and allow it to heat for a few minutes. Next, hold the soldering iron like you are holding a pencil. Be careful not to cover the holes with your fingers. It gets hot. Lastly, start drawing your designs. You can keep it simple like these and draw dots and lines. 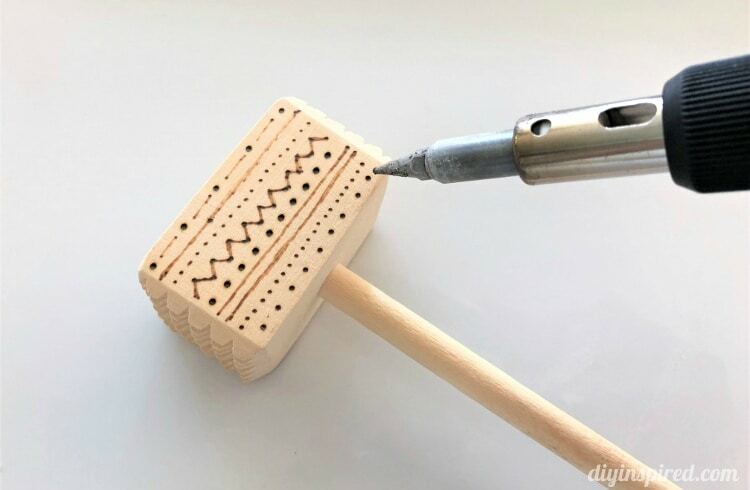 A quick tap of the soldering iron will create a small dot, while a dot made using pressure will make a larger dot. Play around with the size you like. 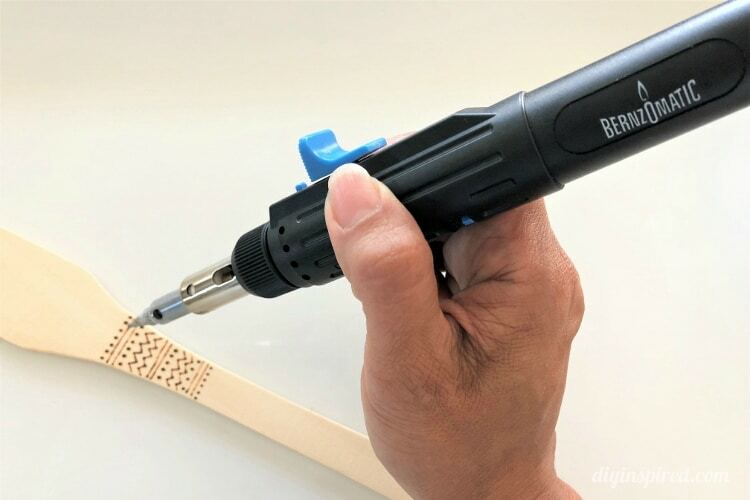 If you would like, you can draw words with a soldering gun like, “stir”, “mix”, “scoop”. To help, write the word with a pencil first and then trace. Keep a damp sponge next to you to keep the tip clean. 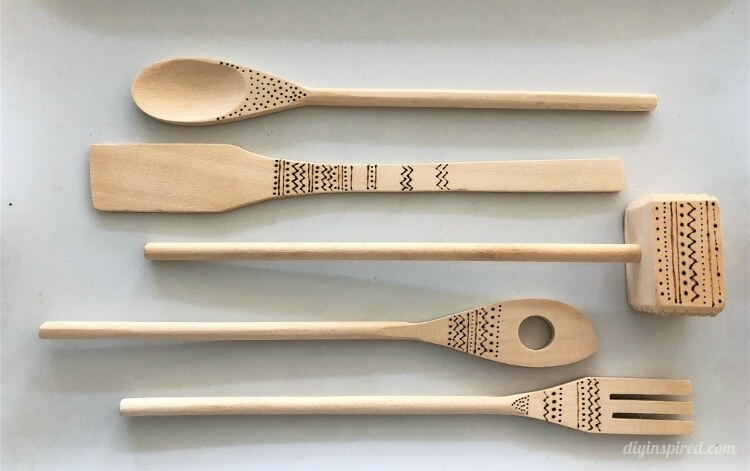 Gently wipe away any burn marks as you go with small quick strokes. Keep the soldering iron in a stand when not in use. I like to use the rim of a plate. Turn off the soldering iron when not in use. After filling a soldering iron with butane, wipe away any excess that may have splattered out. Never touch the metal tip. Like using a soldering iron? Here’s another fun project for how to make pressed flower glass pendants. 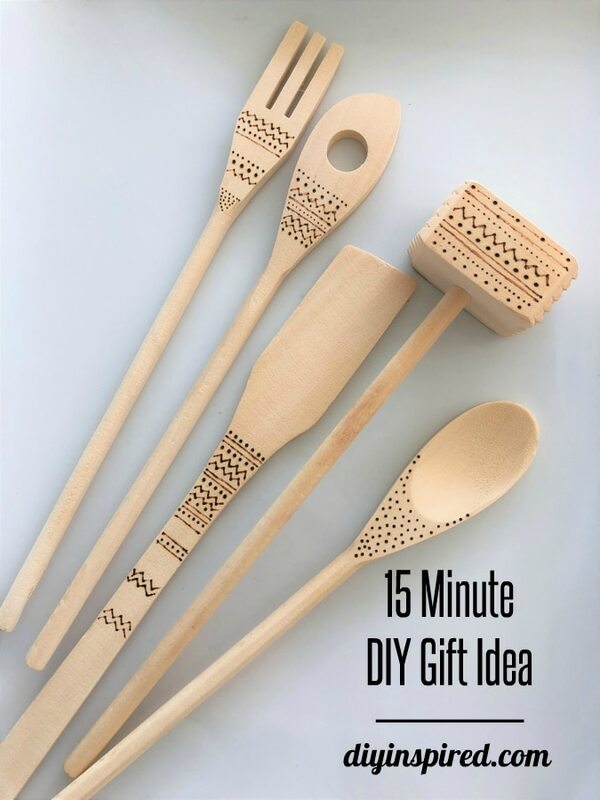 In case you missed them, here are some other fun DIY gift ideas. Love it-I need to get a soldering iron like that ! It’s the best! Hmmm…Christmas idea? Ha!